Our pets often share a close bond with us- some of us treat our pets as if they were family. Having to part with them even for a couple of days can be a stressful experience, as any animal lover will tell you. We live in a world where overseas vacations, work assignments to different countries and migration are increasingly common. You give a lot of thought to security and to whom the keys of your house should be given but when it comes to your beloved pet, what happens? Can you take them with you, leave them behind with friends or family or give them up for adoption, you wonder. If the first option is your preference, this is where Jet-A-Pet comes in. Jet-A-Pet is a specialist provider of pets and animal transportation and relocation services, a novel concept to Sri Lanka. Launched this year, the company located at 38E1 Samudhra Devi Mawatha, Ethul Kotte, focuses on professional, personalised and door to door travel arrangements for your pets. Air travel for pets, while not new, is still evolving so choosing a specialised and caring relocation service is the best way to assure the safety of your pet. A number of countries require pet owners to use an approved pet transportation company. The costs generally include the flight, the suitable pet container, fees for documentation and administration, fees for a required period of quarantine (for some countries). In addition, there will be vet fees for checking your pet’s health at both ends, including government authorised vets. 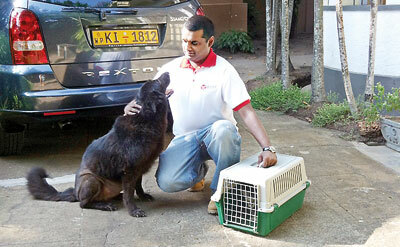 Managing Director of Jet-A-Pet Gayan Wickramaratne says that it was his girlfriend who is an ardent animal lover who inspired him to launch this business. “For everyone here at Jet-A-Pet, pets are members of a family and will be treated as such. Unlike people, pets do not get over-the-counter ticketing services, there is a process and not all airlines in Sri Lanka are adequately knowledgeable about the process of pet relocation as it is still fairly new here,” he says. The main concern of most countries with importing and exporting pets is the possible transmission of diseases – the spread of rabies and of Avian influenza, which can spread from birds to humans. Rabies is a particular concern for dogs, cats, and ferrets. Many countries will require that your pet has a rabies-free certificate and some countries also require blood tests and proof of vaccinations. The need for blood tests can delay the procedure because many countries impose a “six month rule” to pass after the blood tests. When transporting a pet overseas, an important factor is making sure whether your pet dog or cat will be subject to quarantine (which could last up to six months). Countries that do quarantine newly arriving animals (such as Australia and New Zealand) usually require proof of a neutralising antibody titration test for rabies performed more than six months before the date of importation. Even countries that don’t require a quarantine period require a health certificate and proof of a current rabies vaccination. “Although most other countries do have quarantine protocols for animals coming into the country, where the pet will be held at a government facility for a duration seen fit by the authorised body, the requirements to bring in the animal to Sri Lanka are few and can be complied with easily,” says Mr. Wickramaratne. To transport a pet there are unique requirements of different countries which includes: IATA regulations, the European Union Certificate, Airport Entry Documentation as well as Freight Co-ordination. Airlines can refuse to ship pets if their crates do not conform to the IATA standards. Most countries of the European Union and a growing number of countries around the world now require dogs, cats, and ferrets to carry an implanted microchip transponder, which identifies them and can be linked to vaccination and health certificates you file when entering the country. Dogs and cats can be transported in the cabin if their crate is small enough to fit under the seat, as checked baggage, or as cargo. If you do not travel with your pet and decide to ship it separately, it will be shipped as cargo in the pressurized cargo compartment of an airplane. The charges vary according to the size and the type of animal and kennel’s weight, the size of the animal and by destination. For an International-inbound relocation of a pet dog , excluding the flight costs, it would cost around Rs. 40,000 which includes documentation, Freight Co-ordination and vet fees for checking your pet’s health. For a pet cat it would be roughly Rs. 30,000. Jet-A-Pet’s promise is to simplify the process by offering their clients the most up-to-date and comprehensive information required for importation and exportation of pets, says Mr. Wickremaratne.